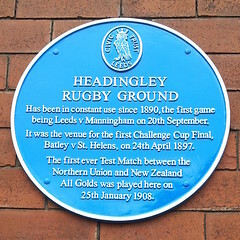 Headingley Rugby Ground. Has been in constant use since 1890, the first game being Leeds v Manningham on 20th September. It was the venue for the first Challenge Cup Final, Batley v St. Helens, on 24th April 1897. The first ever Test Match between the Northern Union and New Zealand All Golds was played here on 25th January 1908.